Research published by IAM RoadSmart has shed new light on the significant number of UK motorists that continue to flout 20 mph speed limits across the country. 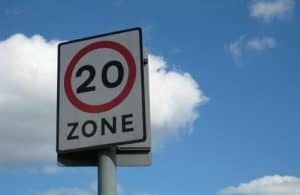 According to a new poll from the body, more than four-fifths (81 per cent) of UK drivers admit to regularly exceeding 20 mph speed limits in areas where they are in effect, despite the potential dangers this can pose to vulnerable groups. IAM director of policy and research Neil Greig said: "IAM RoadSmart have always felt that blanket 20 mph limits, enforced by signposts only, are simply not enough to convey the reason for slowing down to drivers. "Targeting the worst locations with traffic calming and other engineering features is a much more effective way to make 20 mph limits self-enforcing." Overall, government figures show that excessive speed was a factor in 15 per cent of all fatal crashes on the UK's roads in 2016. As a result, Mr Greig argued that routes on which drivers are consistently breaking the speed limit should be assessed more regularly, with a particular focus on ensuring 20 mph zones are being adequately enforced for all motorists. Molly Benton, brand manager at Fuel Card Services, adds: "A reduced speed limit of 20 mph is in effect for a reason in each of these areas, it's therefore wholly irresponsible for motorists to continue to place vulnerable groups in danger by speeding on these roads."